10mm plastic, single profile core, painted face on one or two sides. 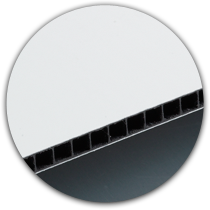 Pro-Lite features a high-gloss, factory-baked polyester painted aluminum, on two sides or with a coated aluminum backer, bonded to a 10mm single profile core that is resistant to water and exposure to UV light. Click here to view our full selection of standard colors. Custom colors are available upon request.